Liz grew up as a "grease monkey" to her father, who taught her to fix and work with many things. She also enjoys watching auto races. This is the truck that does the dirty job. Today, I'm writing about a crappy topic. So--you've just moved in, and discovered that your new home uses a septic tank system for handling wastewater. Delightful! No, we were not thrilled to make that discovery, either. In fact, we almost didn't buy the house! My husband and I were both born and raised in big cities, and this house is our first experience with a septic system. 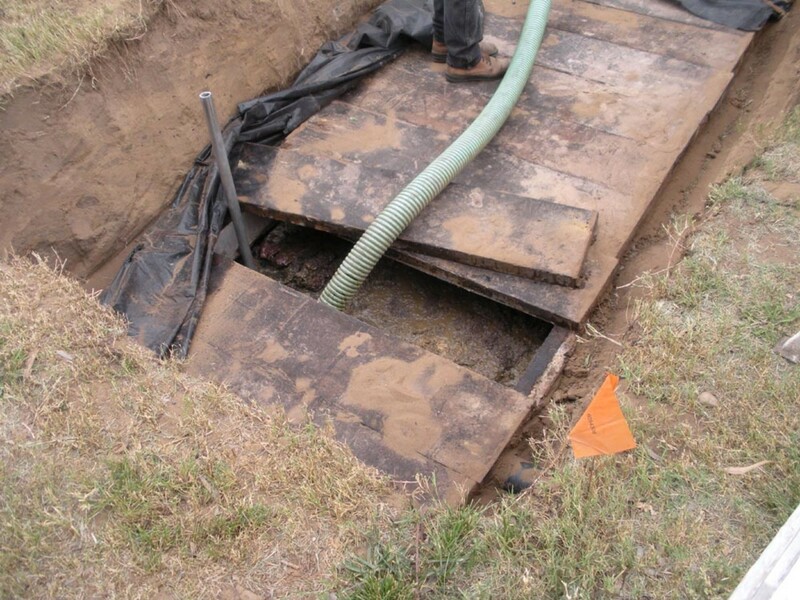 Septic tanks were the norm in years gone by, before city-wide wastewater treatment plants and complex sewage plumbing under the streets connected each home to the treatment facility via a common sewer pipe. Virtually everyone had them; learned how to deal with them; knew how they worked. These days, the septic system is a vanishing means of dealing with household wastewater, both black and gray. There are still areas using them however, mostly in rural and semi-rural areas like ours. As a rule, there are city codes dictating the minimum distance from the house for the septic system to be located. Where I live, it must be just ten feet from the house. I'm glad ours is much farther away--ten feet seems uncomfortably close to me. Just because they are becoming somewhat out-of-date, however, doesn't mean we should ignore that earlier technology or forget how they work. If something should happen to our electrical grid on a massive scale, the pumping stations that handle our wastewater through municipal sewers would cease to operate. We'd be back at the pre-industrial-revolution era in many ways. 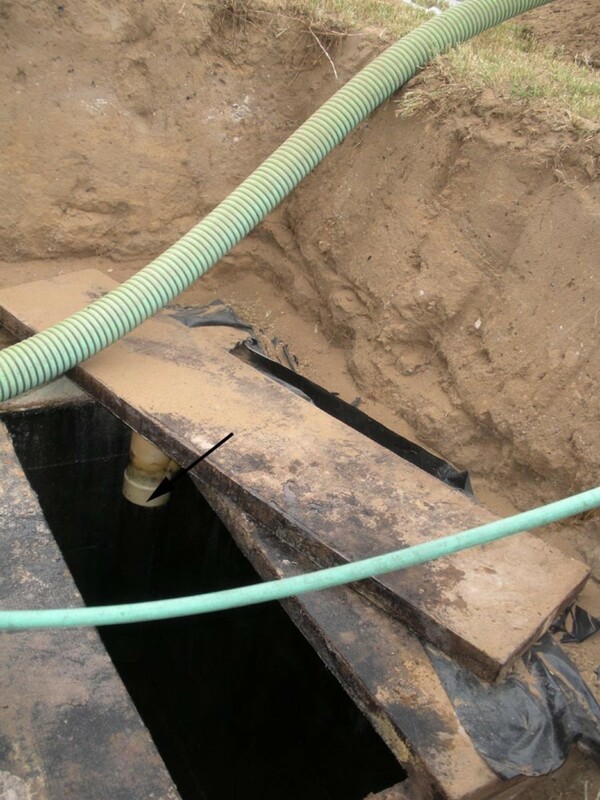 The septic tank has an intake line connected to the waste lines from your home's plumbing. 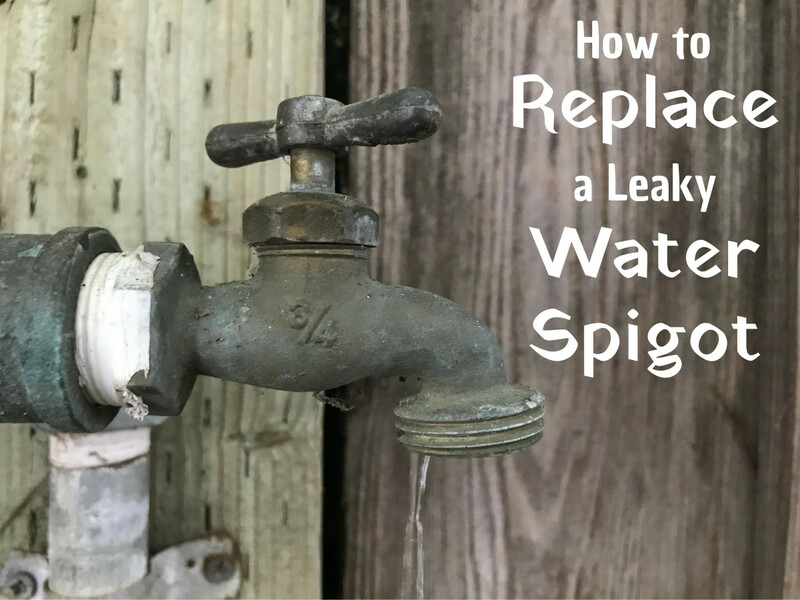 All of the water, both gray and black, are routed to the septic system, so once it's in the main waste line on the way out of the house, both kinds of water get mixed on the way to the tank: at that point, it's all classified as black as water. You don't want to see it, smell it or handle it. You certainly don't want to fall into the tank! 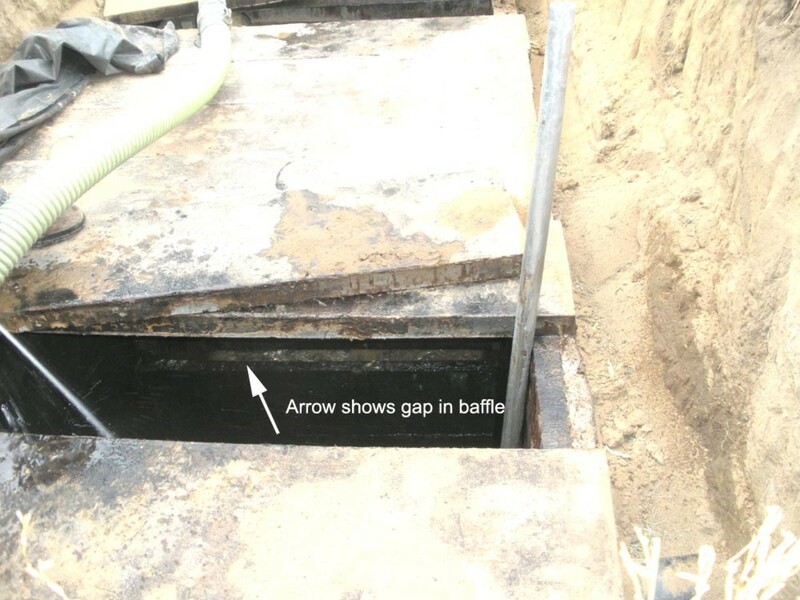 Therefore, the tanks are never above-ground, but buried several feet down. With such a system, the home is not connected to a magical city sewer that sweeps everything far away where you never have to think about it again. On the contrary, you need to know all about your tank--its capacity (in gallons), expected lifespan, construction materials, and when it was last emptied. You also need to know where, exactly, it is, and how deeply it is buried. According to our local pumping company, as a general rule, tanks should be pumped out about every 2 to 4 years. This depends on many things, including how many people live in the house, how many bathrooms, etc. This translates to the expected load input. The size of the tank therefore is the most important thing to know. In order to know the capacity, you need the measurements. We found out ours when we had it pumped. You need the cubic measure (length x width x depth). Once you have that, here is a handy chart to convert cubic volume into capacity by gallons. Finally, we scraped together enough funds to have the job done. All I can say is, "WOW!" We were on borrowed time! We've lived here for the best part of 8 years. The prior owner had it pumped out just before they turned over the keys back in 2003. Good thing it's a huge tank! But, it is an older tank, without the risers, so we had to have the whole pit dug out. (Grandsons are useful for something, after all!) When the sanitary company pulled the first cover board off, we were shocked to see the contents (yeah--you want a clothespin on your nose!) within six inches of the top! The service guys said the capacity of our tank is 1500 gallons--they were wrong--that's the capacity of their truck! They had to leave to go to their dump station and come back to finish! I calculated the gallon capacity, using a chart I found..and it's actually 2880 gallons!!! That's a lot! You may have seen those huge short-round tankers driving around. The place most folks are likely to come across them is in areas where portable public toilets are being used and serviced. The folk-jargon nickname for these pumper-tankers is "honey wagon." HUH??? No one has ever been able to give me a reasonable-sounding explanation for that! What an oxymoron! So, how often should you have your septic tank pumped out? Well, the short answer is, "it depends." It depends on many factors: size of the tank, number of persons occupying the home full-time, and whether or not there are periods of heavier use. See the handy chart at this link, for a general idea. Gray water is used, somewhat dirty water, but is not generally harmful or dangerous to handle or to re-use, say to water the landscaping. It comes from such activities as diswashing, laundry and bathing. Black water, on the other hand, is a serious health concern. It is considered a 'bio-hazard' material. The sole source of this water is the toilet. It is full of all sorts of nasty organisms, of which the infamous disease-causing e.Coli is foremost. How Often Should You Pump Out the Tank? Septic Tank Pumping Schedule Table - how often should you clean the septic tank? 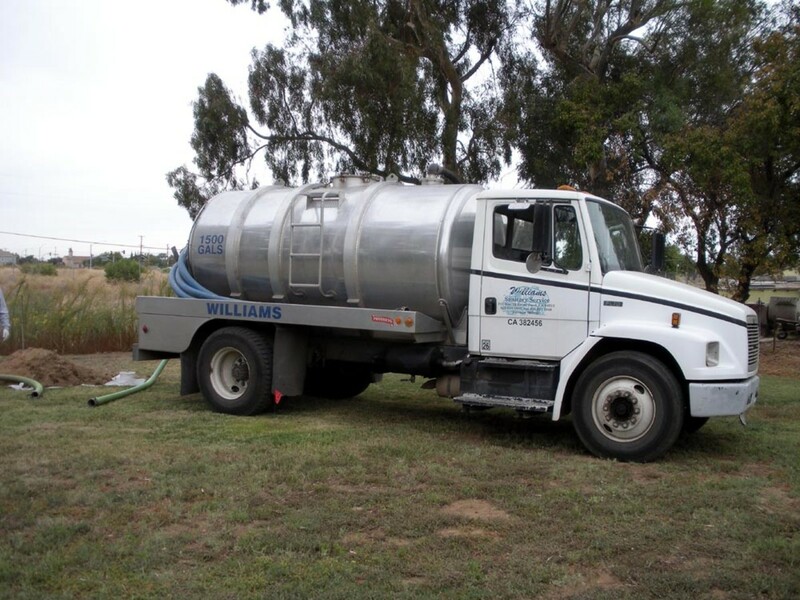 Septic tank pumping schedule table: Septic tank cleanout schedule - when do I pump out the septic tank? For the most part, modern tanks are made from concrete or high-density durable plasitc. Older ones, like ours, are made from pressure-treated redwood, which is no longer available. In fact, according to our local pumpers, it is no longer legal to build the tanks from wood. (I'm unsure if that is true everywhere, or just here in California.) Existing ones are grandfathered in, but should the system fail, the entire old tank and associated plumbing would have to be removed and a newer style installed. 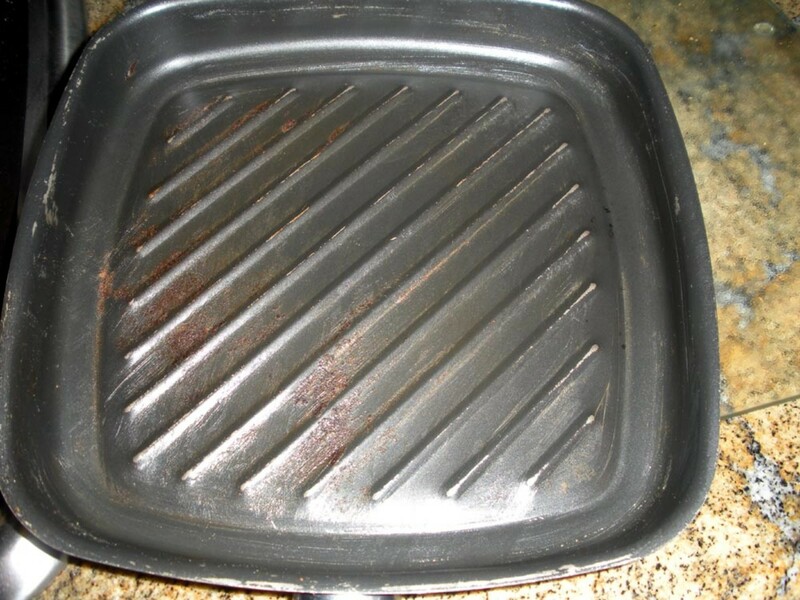 Some types of lids are separate, such as the wooden boards that cover a wooden tank; some are built as part of the entire unit, as with a plasitc tank, which will have no lid but the cap and preparatory fitting for a pump out stack. Concrete tanks may be made either way, depending on their age. Mostly these days, they are pre-fab units brought in on trucks and put in place with a crane. Plastic has the advantage of being lighter, and can be shoved around by a couple of guys, or picked up by a small forklift. The top of the tank is about 3 feet underground. That's a lot of dirt! All ready for the pump-out service. No matter the construction material of the tank, the basic workings are alike. Inside, there is a baffle that runs across the center, dividing the tank into a solids side and a liquids side. About halfway up, there is a 2-inch gap in this baffle. Through here, water flows from one side of the tank to the other. 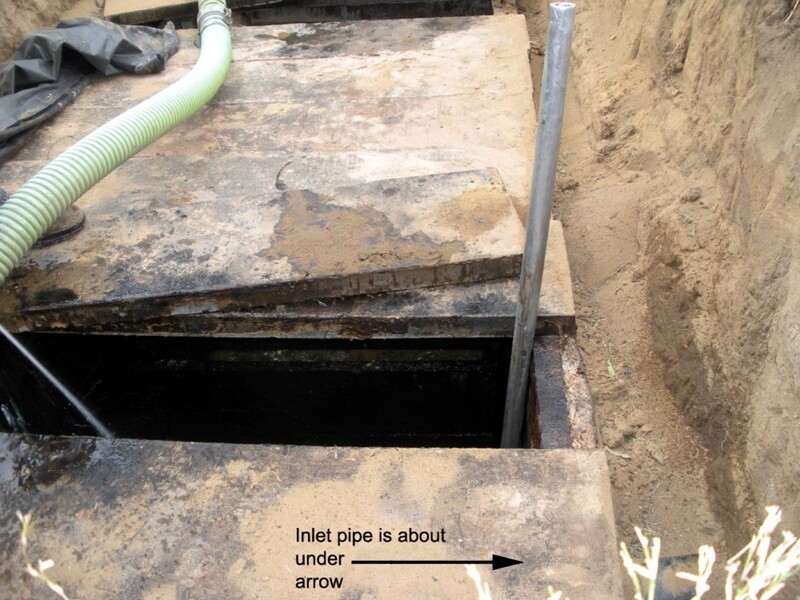 The inlet pipe from the house enters on the solids side. From the inlet point, there is a 90-degree elbow in the pipe, which then runs down about 2 feet inside the tank, delivering the waste further down inside. Initially, everything stays on this side. As the tank begins to fill, over the course of a few months, the water level rises to a point where it flows through the baffle, and runs into the liquids side. For some mysterious reason, the solids, which are said to float, nonetheless, remain on the solids side, and do not follow the liquid through the baffle. On the liquid side, there is a pipe leading from near the bottom up and out the end opposite the inlet. 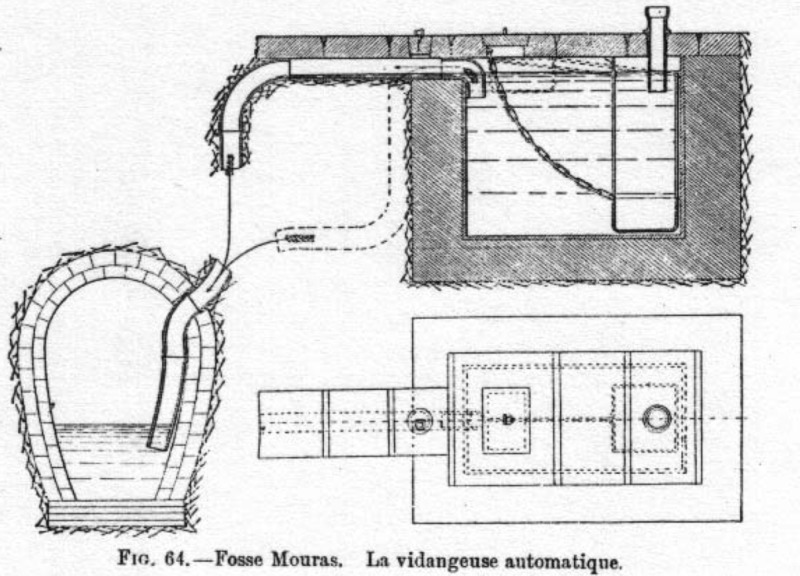 This works on the principle of water finding its own level, so as the tank fills, and the liquid side gets higher, the water is pushed up the outlet pipe by natural hydraulic force. Outside the tank, this pipe is connected via "T" fittings to smaller diameter, pipes, through which the water exits the system into the ground. These are called leach lines, because they allow the wastewater to leach into the dirt. Depending on the native soil, there may be gravel and drainage rocks added around the leach lines. The exit point for these lines is called the leach field. These are also underground, at about the level of the tank's top. Some of you may remember a book written years back by funny lady Erma Bombeck, titled, The Grass Is Always Greener Over the Septic Tank. Well, no, not quite: the grass may well be greener over the leach field--but I guess that wouldn't have made such a catchy-sounding title. You don't want it greener over the tank itself--that would most likely mean an overflow condition, or a failure of the tank. Either would mean a very messy, mega-bucks repair! Once the tank is pumped, you can just see the gap in the baffle--Same image as the one showing inlet, but photoshopped much lighter so the gap would show up. Go easy on the laundry detergent--most brands direct the use of quite a bit more than you actually need; it's a marketing ploy to get you to buy it more often, and is wasteful. 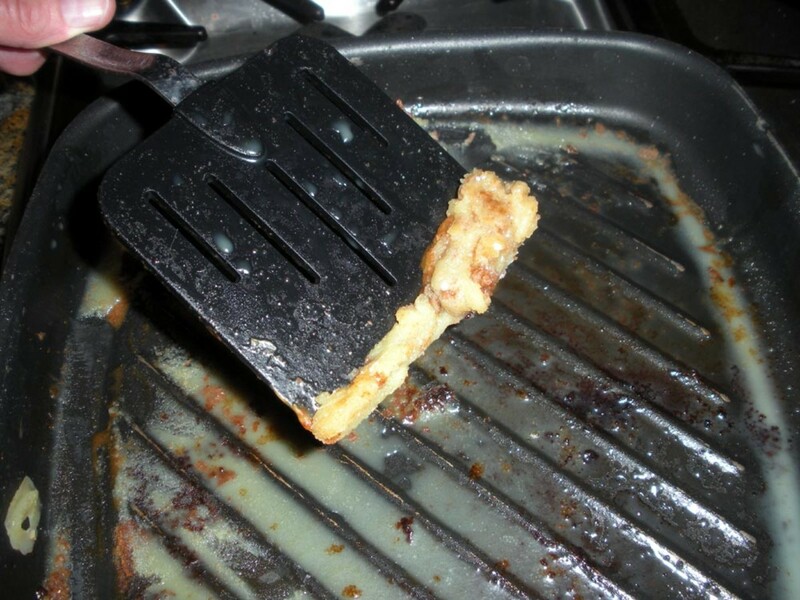 It is unavoidable to have some small amounts of grease go into the tank. 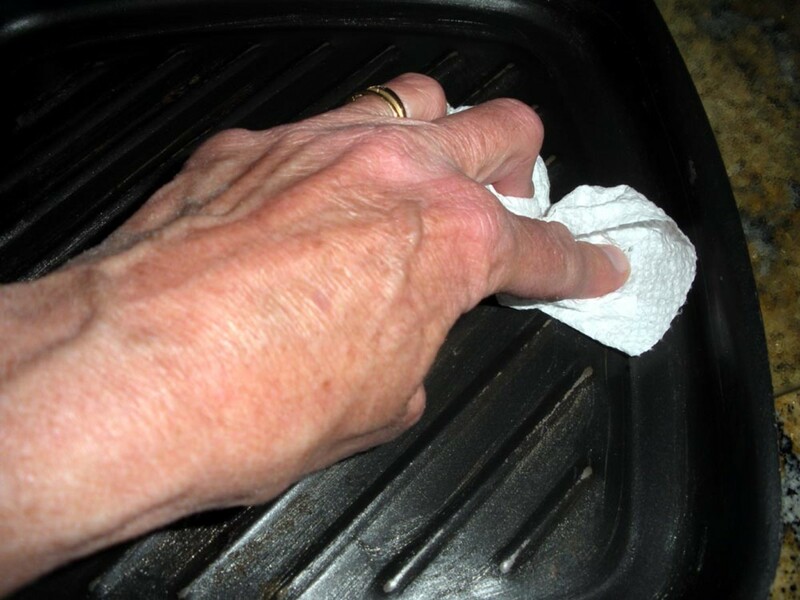 But don't put a greasy frying pan or dinner plate to the sink before wiping the worst of the grease out with paper towels, and deposit in the trash. Chemical drain products can upset the balance of the proper functioning of the tank. If you have a clog, use mechanical methods to send it on its way. Coffee grounds should go in the trash. There are also other uses for them indoors and out. 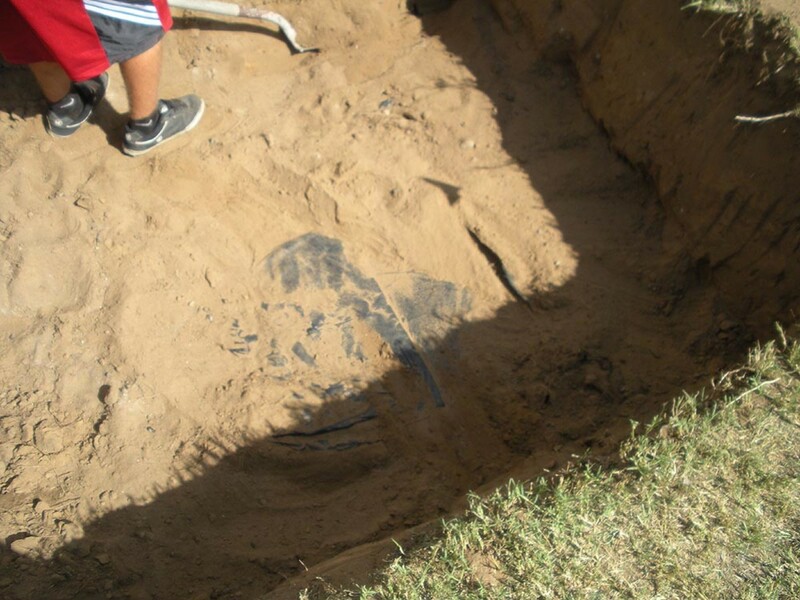 The best way to care for your septic system is to be careful what you "feed" it. 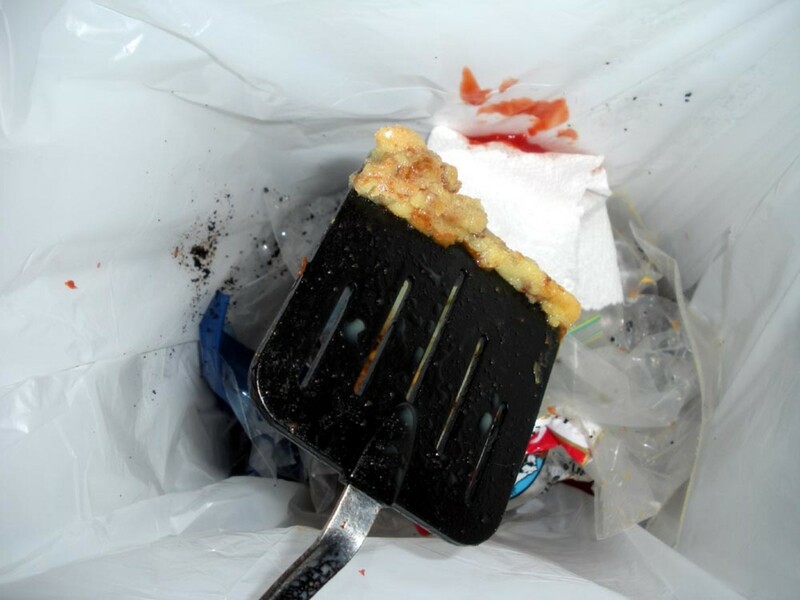 Do not dispose of great amounts of grease down the drains--wipe greasy plates or platters with paper towels and dispose in trash, not down the sink; don't overdose on the laundry detergent; don't use the garbage disposal for more than just minor scraps remaining on plates--use the trash or compost pile for large chunks of material, such as all the stems from a head of broccoli, or the "science experiments" you clean from the fridge on trash day. You get the idea. One more thing that should never, ever, under any circumstances, even in tiny amounts go into your septic system is kitty litter. If you're using scoopable litter, do NOT flush the solid waste! Ever! Don't even think about it! There will be clay bits clinging to that waste, and over time, it will amount to enough to cause problems. You do not want clay in your septic tank. 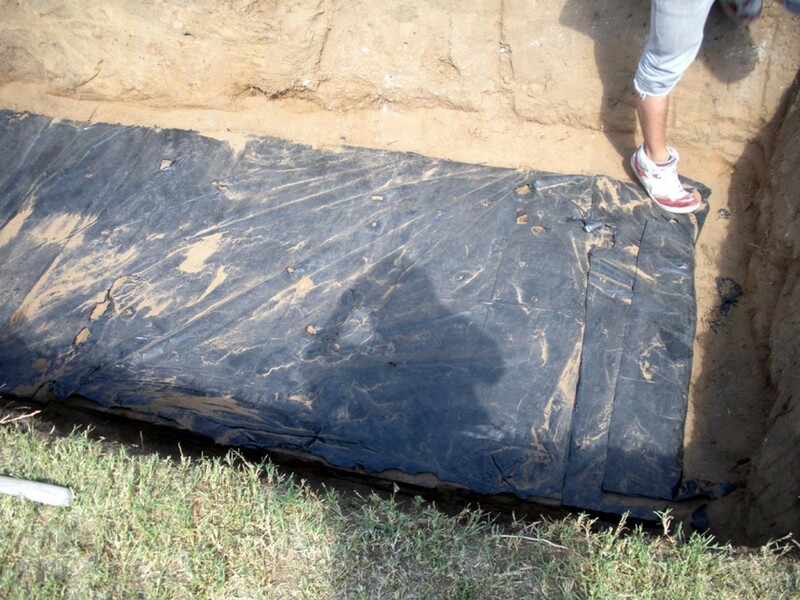 If you have dirt or clay, the cleanout company will charge extra because it is difficult to remove. You shouldn't flush that stuff anyway, because it can also cause problems just in the wastewater pipes. Use a disposal bag instead. Using a septic system is not, in daily practice, much different from standard plumbing after all, for many of the things that will keep your septic tank functioning well are the same common-sense things that will keep all your pipes clog-and-trouble-free. 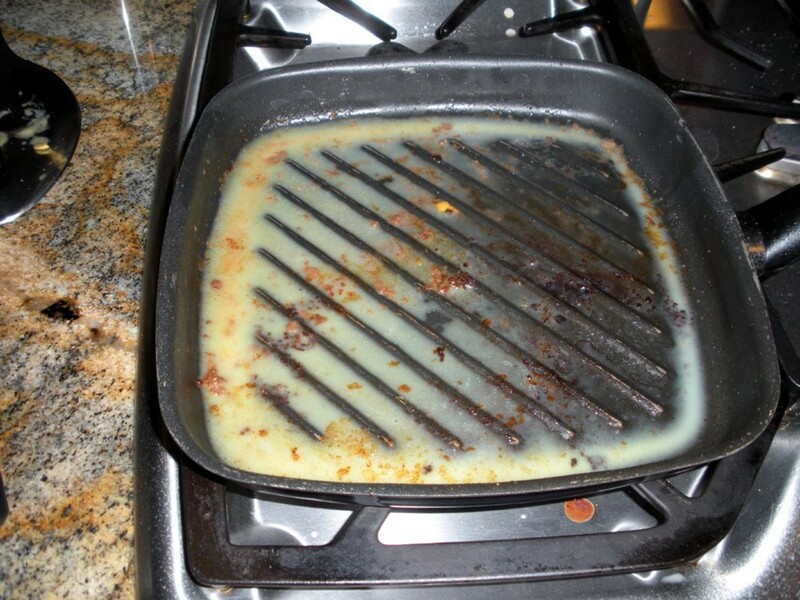 Don't even think of dumping this pan of grease into the sink or down the toilet! 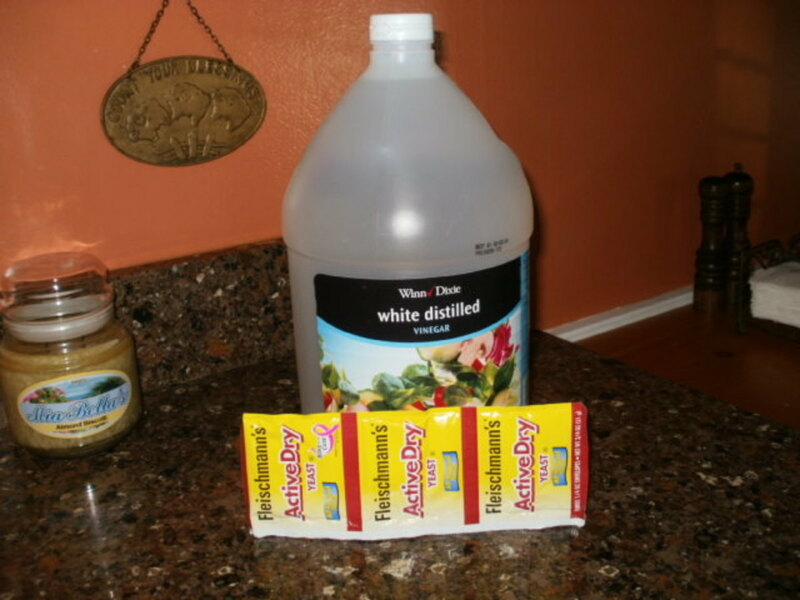 Do I Need to Mess With Chemical Additives to Make the Tank Work? The advertisements you see for various compounds to be flushed down the toilet to "help your septic tank break down wastes" actually cause more harm than good. 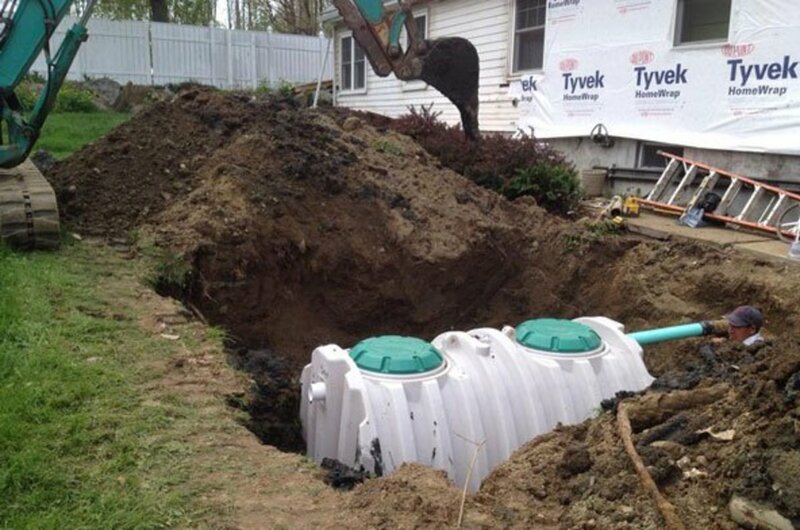 Septic tanks were designed and working just fine long before the invention of such additives. Disgusting as the contents may be, their breakdown is part of a natural process, and happens with no help from humans. The natural input we provide is all they need. The service guys said to absolutely not use those products. You can also get into trouble by using chemical drain openers as well. 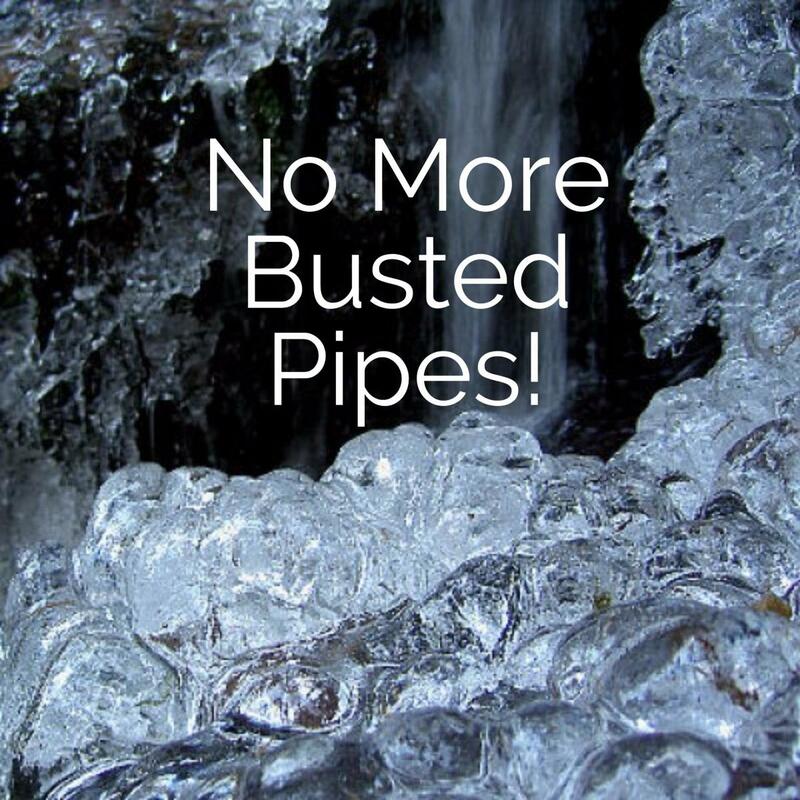 Some of those products may well eat through a clog--but in the process, may also eat through your pipes! They won't help matters inside the septic tank, either. The tank will handle normal input of soap in the amounts used for bathing, laundry and dishwashing, but any other chemical input can disrupt the natural process. There may be some room for debate over the cost of having a septic system vs. city sewer. 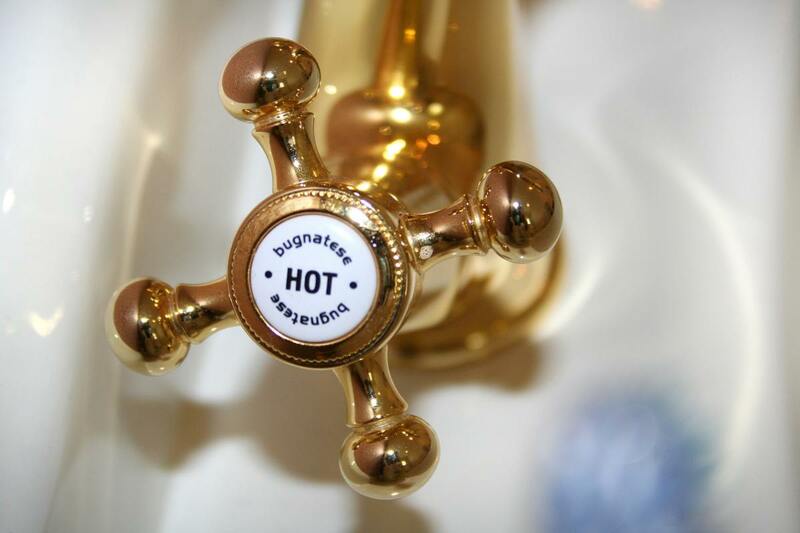 There is the cost of having it pumped out every so often, and the possible very high cost of having the entire system dug up and replaced, perhaps once in a lifetime. In our area, the average pump-out fee runs between $520 and $650. That seems like a lot, and it can sure feel like a lot to have to come up with all at once. And that is just for the pumping service. If they have to also do the digging-up for you, it will add at least another $150 to $200, or more, depending on your soil, and how long it takes to dig. Yes, even a mechanical digging beast will take longer to get through clay than sand. We saved ourselves a good portion of that cost by hiring our grandsons to do the digging and re-filling, at half the price. 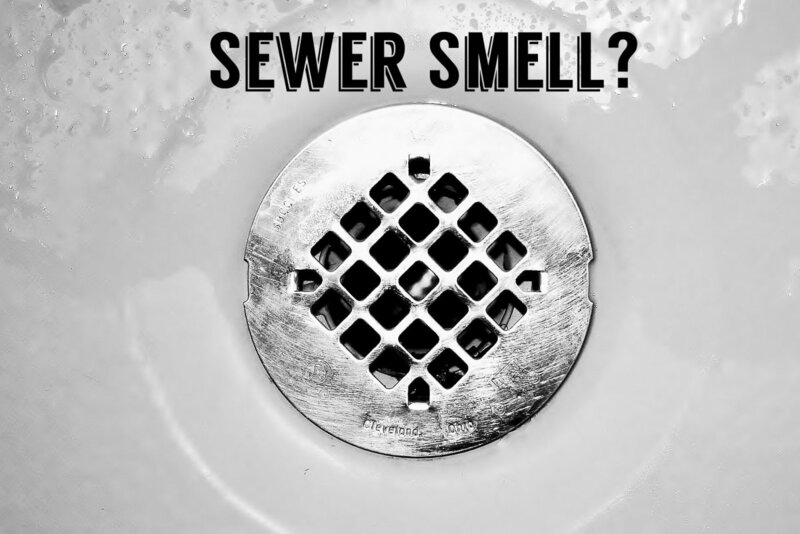 If city sewer is becoming newly available in an area, depending on the city, there may be a charge for hooking up ranging wildly from $4,000 to as much as $30,000! It may or may not be demanded in a lump sum, or it could just be added to your property tax bill as an annual fee...in which case, it will probably never be paid off in full. Now, if your home is already hooked up to city sewer, it would appear at first glance to be free. Wrong. Take a look at your annual property tax bill. It's in there, and calculated out on a per-year cost, and compared on that basis to the septic system, well, you tell me which actually comes out cheaper. Thank you very much. I'm glad you liked the article, and thanks for stopping by and leaving a comment. Thanks for stopping by and for your comment. I'm happy to have been of service. Now you can take that money and go get some football tickets! ;-) Cheers! You may have just saved me a couple hundred dollars by not having to buy any more septic chemicals. Thanks! They recommend against the chemicals; we've never used them, and as you say, it works just fine. Thank you very much for stopping by and sharing your experience. We live in the country and have a sceptic tank. The builders dug a huge hole, covered it up and just left it be. No chemicals, nothing. Ten years on, it still works fine without odours or any problems. Thank you, fdoleac, but I am not "lakenorman." That was one of the other commenters. ;-) However, I am pleased you found the article useful. lakenorman- very informative and will be a valuable resource (link) for home buyers. Thank you very much for your awesome comment. Much appreciated. Great topic for a hub! This is something that everyone who owns a house should bookmark because you never know when a problem might arise. Thank you very much, lakenorman--I'm glad you found the article useful. Nice article complete information with images..
Where my mother-in-law lives, they have propane, but I think they do have sewer. We do have natural gas here, but only just got streetlights earlier this year (2011)! Awesome explanatory hub! Our previous home was on septic and also had a propane tank, since neither sewer nor natural gas had been extended up the mountain on which we lived. We were there for 5 years and didn't have any problems, but I always worried a bit. Good luck with your system! Now that you have all the knowledge, you are better prepared to deal with any .... er.... crap that comes up! I will check out his work... I like a good laugh! Gotta read his stuff--it's too funny!